These easy Instant Pot Turkey Meatballs are a new meal prepping staple in my household. 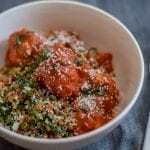 Though they may look like traditional meatballs, they contain both a secret ingredient and hidden vegetables — perfect for a home chef who needs a healthy recipe to feed a crowd. In a mixing bowl, combine the turkey, turkey sausage, Italian seasoning, Panko breadcrumbs, and egg. Using your hands (be sure to take off any jewelry!) mix all of the ingredients until well combined. Wash your hands, then cover and chill the mixture in the refrigerator for at least 1 hour and up to 24 hours. Using a scoop or spoon, portion your chilled mixture into equal sized meatballs — they should be between ping-pong and golf ball sized. Depending on your preferred size, you will end up with between 24 and 30 meatballs. Turn on the “Saute” function on your Instant Pot. When the pot says that it is “hot” add 1-2 tablespoons of olive oil, along with the diced onion and carrot. Saute for 3-4 minutes, until slightly softened. Season with salt and pepper to taste. Add the harissa paste to the pot with the onions and carrot. Saute with the vegetables until the paste is slightly caramelized. Add ¼ cup of water to mixture, scraping up any browned bits from the bottom of pot. Layer the meatballs over the cooked vegetables, then add the crushed tomatoes on top. Leave the ingredients layered like this! Cover the Instant Pot and ensure the lid is set to “sealing”. Cook the meatballs on high pressure for 12 minutes, then manually release the pressure. Stir in the chopped basil. Taste the sauce, and season with salt and pepper to taste. Serve your meatballs with your favorite pasta, grain, or roasted vegetables! Enjoy.